I really enjoy reviewing my year through the focused action questions. This is the sixth time I do this and I love it! I hope you enjoy it too. 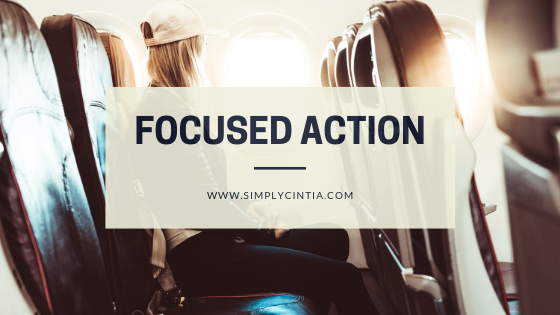 The only way to improve is to focus on your next action. • What is the single biggest time-waster in your life, and what will you do about it this year? Mindless screen time is the biggest time-waster closely followed by regret. I have decreased my screen time and I have a concrete plan to make sure my time online is very productive. As far as regrets, I plan on following my faith goals which addresses what I plan to do with regrets. Basically, I'm going to abandon that practice. • For whose salvation will you pray most fervently this year? The same people from last year plus a few. I'm going to have an actual list. It's more for my sake than God's of course. • What one thing could you do to improve your prayer life this year? Pray more often by scheduling daily time to do it. I thought about starting a prayer group but I know they are highly unpopular. Instead, I'll focus on praying with my family. • What single thing that you plan to do this year will matter most in 10 years? In eternity? Investing in my marriage and in my kids. I'm passionate about making an eternal difference in their lives for the Lord Jesus. • What area of your life most needs simplifying, and what's one way you could simplify in that area? A few of my chores. I've made progress in 2018 but I'm determined to simplify my process for effectiveness' sake in 2019. One way I could simplify decluttering is keeping it as a regular activity instead of emergency a few times a year. • What habit would you most like to establish this year? Reading. I read everyday but I want to replace mindless browsing with reading. • Who do you most want to encourage this year? • What's one new way you could be a blessing to your pastor (or to another who ministers to you) this year? I can find creative ways to encourage my husband Zeke in his ministry. • What's one thing you could do this year to enrich the spiritual legacy you will leave to your children and grandchildren? I can teach the Bible and other spiritual discipline such as prayer to my children. • What book, in addition to the Bible, do you most want to read this year? I made a list of 25 books I want to read. I'm starting soon and I can't wait! • What one thing do you most regret about last year, and what will you do about it this year? I thought different people were "for me," in season and out of season. I learned that I still had a lot of convenience friendships. If it's not convenient for the other person (or if they don't need something I can do for them) I'm out of their life. Next year I plan on remembering this lesson by cherishing the friends who choose to be there for me for a lifetime. • What's the most important trip you want to take this year? • What skill do you most want to learn or improve this year? I want to be a better writer. • What one biblical doctrine do you most want to understand better this year, and what will you do about it? This is not a doctrine but I've been curious about what God thinks about the role of women in ministry. I've had 7 years of questions and I just need to study. • If those who know you best gave you one piece of advice, what would they say? Would they be right? What will you do about it? I think they would say, God is reliable so keep believing Him. I know they would be right. I will keep believing God. • What's the most important new item you want to buy this year? • In what area of your life do you most need change, and what will you do about it this year? I started my health overhaul last year and this year, I will finish it. I will focus on nutrition until I arrive at my normal BMI.